Need to make a bulk order? Bulk orders may be available at discounted rates. Contact us for a free, no-obligation quote. Promote your business, services, products or even an event with a stylish retractable banner. The retractable stands are conveniently packed in a small bag and set up in a few easy steps. 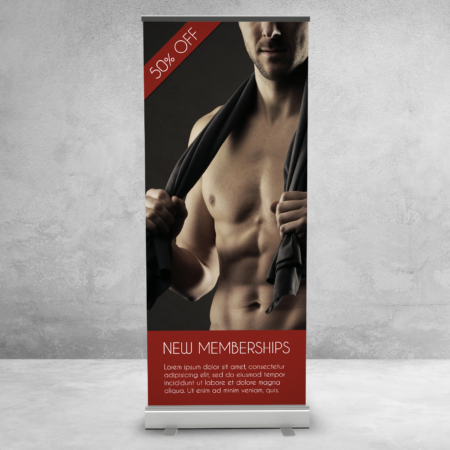 Choose from two banner sizes and stand options. If you are supplying your own design or have assets you would like included with a custom design, please zip and upload here. Submitted designs and assets are treated “as-is”. Customer supplied graphics for use on print products will be treated "as-is". It is recommended to use only HD graphics in vector format. Spiderfly Studios does not print any products directly. As all of our printed product listings are on-demand, they will not be printed until payment has been processed. Once the artwork and/or mockups are approved by the customer, the items are sent to print and are no longer eligible for a partial refund. Exceptions to this policy will fall within the return policy of the printer used, which varies by product. If you have any questions or concerns regarding this policy, please do not hesitate to contact us for clarification. Unless otherwise specified, Spiderfly Studios will receive all printed orders for a final quality assurance check before being delivered to the customer. Should we find an error with the printed product, we will notify you of the issue and contact the printer for a rush re-print. Should an order be directly delivered by the printer and an error is found, we request that you send us an HD photo of each issue found within 48 hours of delivery. Spiderfly Studios will contact the printer and diligently negotiate a resolution. Unless otherwise stated or requested, all products will be shipped via USPS complete with tracking and insurance. Spiderfly Studios bears no liability for lost, stolen, or damaged shipments. Claims for missing or damaged shipments are to be made directly to the USPS or other carrier used. Shipments outside of the United States may be requested via custom quote requests. Costs for international shipping will vary based on destination.